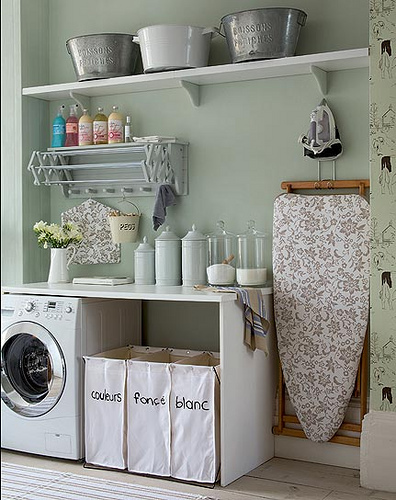 If you’re lucky enough to have a dedicated laundry room, you know that it can easily become disorganized. Whether it’s items from other areas of the house living there permanently or it’s half-finished laundry stacking up, the small room can quickly seem out-of-control. We’ve put together some of our favorite ideas for designing and maintaining a flawlessly organized laundry room. What Belongs There: Although some people use their laundry room for storage of other items, if you are looking to create an organized space, it’s best kept to it’s original function. The following is a list of items every laundry room should have. How to Organize the Space: Depending on how large your laundry room is, there may be an opportunity for you to have a dedicated folding table. If so, utilize the space below the table to store your 3 hampers. Use the area above the washer and dryer to add shelves for holding all clothing cleaning products. Keep all other areas minimally decorated and with as little storage as possible. This room should be used as much as possible for laundry and laundry alone. The Laundry Room Re-Set: If you find that the room often become disorganized, commit to a laundry room reset once per week. At this time, you’ll fold and put away all clean clothes, wash any dirty ones still there, and re-organize the cleaning products and physical items in the space. If you are committed to this process, you’ll find the space stays clean and organized longer. Claire speaks with anchor Kim Fettig on CBS Atlanta News at 5pm on Holiday Tipping and Gifts. 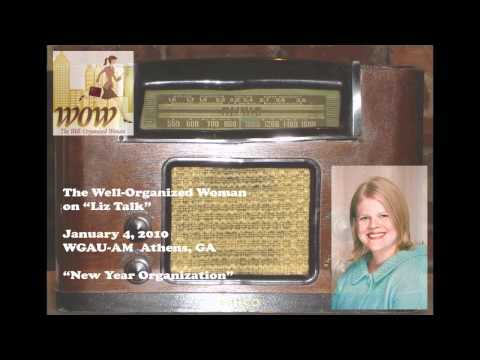 The Well-Organized Woman appeared on News Talk 1340 WGAU in Athens this morning discussing getting organized in the new year with Liz Dalton, host of Liz Talk. 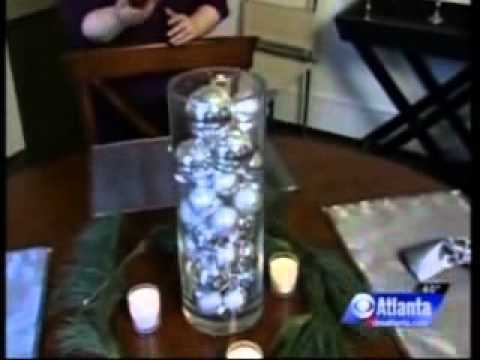 The Well-Organized Woman talks to CBS Atlanta News consumer reporter Kim Fettig about preparing for holiday guests and keeping your home organized. The Well-Organized Woman recently appeared on WXIA’s Saturday morning show to help parents with organizing an empty nest. Tweet Tweet! WOW’s on Twitter! WOW is now on Twitter! If your day isn’t complete without reading some ‘tweets’, you’ll want to head over to WOW’s Twitter page, and become a follower! Tweet Tweet Tweet! The Well-Organized Woman featured on CBS Atlanta’s “Better Mornings” on February 26th! The Well-Organized Woman was showcased in an on-air feature highlighting ways to get out of the house faster in the mornings! Watch the video on the WOW media page!